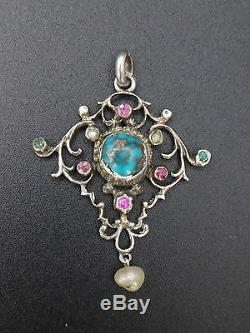 Superb old sterling silver pendant. Adorned with a cabochon of turquoise, pink stones and emerald green ruby? And a baroque pearl in the background. In good condition with some traces of use. The photos are integral parts of the description, thank you for watching them. To report on the state and details. Dimensions: height 4.3 cm width 3.1 cm weight 4.4 grams. Check out my other items. Please read the following before pressing "immediate purchase". All the jewels and objects that you will find in my shop, are old, they are objects / jewels that have already been worn or used and that sometimes have more than 100 years old, even if they are in good condition they necessarily involve traces of use. I attach great importance to the creation of my ads, many photos are available and a detailed description, indicating the defects if there is any. I do not propose sending in letter followed. Payment is expected within 7 days, after this deadline, a dispute will be opened and the object will be put up for sale. For jewelry of significant values ​​(over 500) you have the option to pay in several times (2, 3 or 4 times). With the payment methods indicated above. The jewel will be shipped once the last payment cashed. Thank you for your understanding. The item "beautiful pendant antique sterling silver turquoise stones and pearl baroque xixeme" is on sale since Wednesday, May 4, 2016. It is in the category "jewelry, watches \ jewelry". The seller is "fluffblossom" and is located in / aix en provence, provence-alpes-côte d'azur. This item can be delivered anywhere in the world.